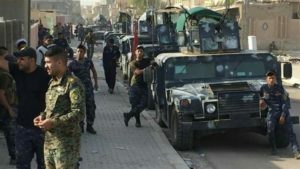 Iraqi forces say they have recaptured the last remaining district held by Islamic State of Iraq and Levant (ISIL) militants in the city of Fallujah. The general commanding the operation declared the battle over on June 26 following nearly five weeks of fighting. Iraqi forces in Fallujah on June 26. “We announce from this place in central Golan district that it has been cleaned by the counterterrorism service, and we convey the good news to the Iraqi people that the battle of Fallujah is over,” Lieutenant General Abdul Wahab al-Saidi told state TV. He said that at least 1,800 militants were killed in the operation to retake Fallujah, part of a broader offensive by Iraqi forces against IS fighters, who captured large swathes of territory in Iraq two years ago. The Iraqi Army was backed in the operation by U.S.-led coalition air strikes and paramilitary troops, mostly Shi’ite militias. Prime Minister Haidar al-Abadi claimed victory over IS forces in Fallujah more than a week ago, but fighting continued inside the city, including in the Golan district. Fallujah has been under the control of the militant group since January 2014. ISIL fighters still control significant areas in northern and western Iraq, including the country’s second-largest city, Mosul. Thousands of families have fled Fallujah since Iraqi forces launched an operation to recapture the city in late May, leaving the government and aid groups struggling to manage the surge of people in camps for the displaced. The UN’s refugee agency says that more than 85,000 people have fled the city and the surrounding area since the operation began. It has warned of the distressing condition in the camps and called for increased funding for efforts to assist the displaced. One of the key aid groups involved in these efforts, the Norwegian Refugee Council (NRC), warned that the crisis was dire. “With every day that passes in the camps, the conditions for some of the most vulnerable keep deteriorating. Doctors are warning of impending disaster,” the group’s Iraq director, Nasr Muflahi, said on June 25.